Four species are known in Europe. Fruitbody boletoid with partial veil, leaving a fibrillose ring. Cap fibrillose scaly. Stipe hollow or solid. Tubes decurrent (running down the stipe). There is strong molecular evidence that this genus must be integrated in Suillus; here for practical purposes, I would prefer to list it as a genus on it own. Note also that the genus Fuscoboletinus is also kept separately, although it also must be integrated in Suillus. Known to me only from the literature. Cap with coarse reddish brown to vinaceous large scales on pinkish, whitish or yellowish background. Stipe cylindrical, solid, whitish or almost concolorous with the cap, with reddish, pinkish or vinaceous red woolly scales on paler background, below the tubes with fibrillose ring. Flesh yellow, sometimes slowly staining pinkish when exposed to air. Tubes short, decurrent, yellow. Pores large, angular, yellow, usually staining pinkish when bruised. Smell not distinctive. Taste not distinctive. Spores 8.5–10.5 × 3.5–4.5 μm. Habitat. Mycorrhizal with Weymouth pine (Pinus strobus). Distribution. Originally from North America and Asia, in Europe apparently brought through its mycorrhizal host and so far known from single finds in Germany. It might be present elsewhere and should be further looked for. Notes. Easily distinguished from the other representatives of the genus in Europe due to its mycorrhizal host. Suillus spraguei (Berk. & M.A. Curtis) Kuntze is suggested to be the legitimate name for this species, when treated in the genus Suillus (see Palm & Steward 1986). Bessette, A.E., Roody, W.C. & Bessette, A.R. 2000. North American Boletes. A Color Guide to the Fleshy Pored Mushrooms. Syracuse University Press, Syracuse. Murrill, A.W. 1914. American boletes. Published by the author, New York. Palm, M.E. & Steward, E.L. 1986. 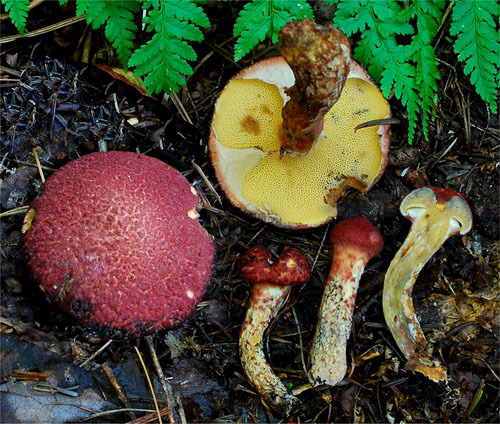 Typification and nomenclature of selected Suillus species. – Mycologia 78: 325–333. Smith, A.H. & Thiers, H.D. 1964. A contribution toward a monograph of North American species of Suillus. Privately published, Ann Arbor.